The Non-Contact Sensor Models NCD01-000 (Without limit switches) and NCD02-000 (With limit switches) are designed for use in applications where very long equipment life is important. 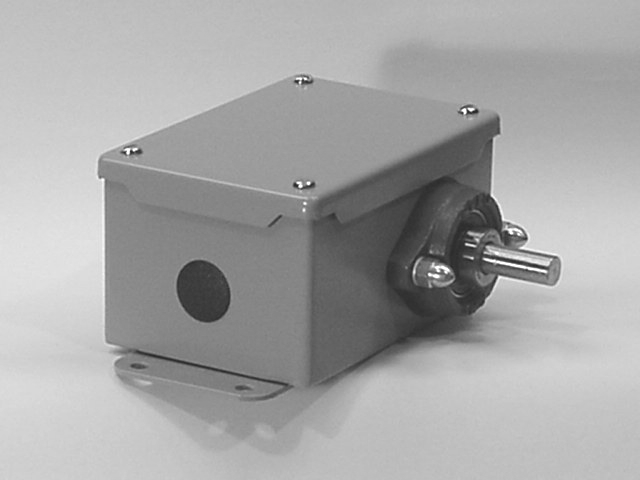 Our Non-Contact Dancer Sensor housing is constructed from 16 gauge steel and is designed to NEMA 12 specifications. These high quality analog proximity sensor which has no movable parts, senses the position of a cam giving a 1 to 9VDC output proportional to the angular position of the shaft. The flange mount bearings are maintenance free and very conservatively sized. The stainless steel shaft is faced, to aid in installation and mechanical connections. Limit switch model (NCD02-000) contains two high quality normally closed limit switches and two adjustable cams to set extreme travel limits. Wiring connections are made easy by a pre-wired terminal strip inside the enclosure. Quality components, precision and modular construction all combine to produce dependability, simplified installation and competitive pricing.